Remember wanting to be Jacques Cousteau? Roatan Island is in the southwest Caribbean Sea and is widely acknowledged as one of the best SCUBA diving sites in the world. I will arrange your transport safely and comfortably from the Airport to our lodge at Turtle Beach. Your shared accommodation is right on the beach! The resort has multiple cabins, two pools, free use of kayaks and SUPs, barbecues and a labyrinth of decks and walkways surrounded by flowers and hummingbirds. You are responsible for your own food for the duration of the 8 days. But we are all in this experience together and we plan to combine with several shared meals and activities. There is also a four-buck water-taxi to West End and West Beach and a plethora of restaurants at both of those towns. Clearwater Adventures will be doing the SCUBA training and bookwork. Located right next door this is not just a typical dive shop. Clearwater Adventures is truly superior. Quality maintained equipment, carefully monitored air, seaworthy boat, outstanding English speaking instructors. I expect everyone will earn their Open Water PADI certification without any difficulty. 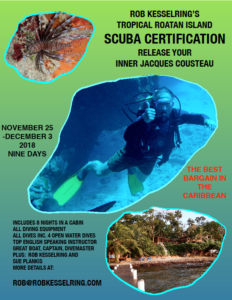 I have a special deal on accommodation and PADI certification. A high quality training and beachside accommodation for half the cost of similar programs elsewhere. Plus you have Sue Plankis and me to keep you entertained and safe. Eight nights accommodation, all diving equipment, all dives -including four open water dives, airport transfers. 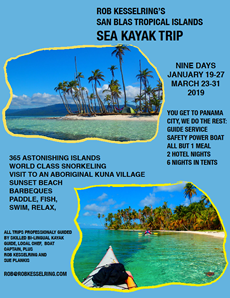 Join Rob Kesselring and Sue Plankis on a 9-Day sea kayaking expedition weaving through 365 tiny Caribbean islands off the coast of Panama. Protected by the outer reef, we will paddle the warm, crystal clear waters along stretches of mangrove forests that dominate the wilderness coastline. In single or double sea kayaks, we’ll navigate the San Blas archipelago camping in tents on deserted islands and enjoy white sand beaches, palm trees, crystal clear water and world-class snorkeling. Barbecues on the beach, hammocks for relaxing, sports fishing, this is a “glamping” expedition. We will also have an opportunity to visit a village of the aboriginal Kuna people who, in many ways, are still living as they have for thousands of years. Our local guide for the trip has paddled the San Blas Islands for many years and also is a whitewater rafting guide every summer in Colorado. He speaks fluent English and is extremely knowledgeable of the San Blas biome and its history. For safety, a modern power launch with a captain will accompany our journey and carry our gear. The launch will also carry our chef who will prepare our meals! We will strive to make this a minimum impact journey keeping the islands wild and free for future generations to enjoy while being respectful of the Kuna people. From dinner on the first day to breakfast on Day 9 all but one meal is included in the trip fee. Kayaks, accommodation at a 4-star hotel is included in modern Panama City on the first and last night, and all airport transfers are included in the fee. What is not included? Your flight to Panama City. Travel and evacuation insurance, the last dinner in Panama City and gratuities for the guide, cook and boat captain.